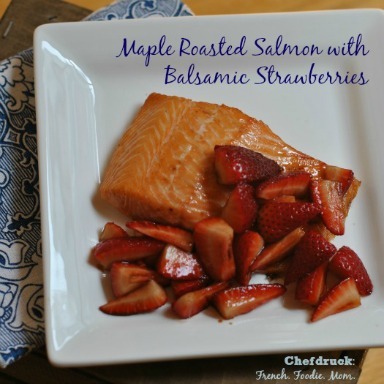 Don’t these frozen days make crockpot cooking so appealing? Walking into a warm home filled with the aroma of a dinner that’s been cooking itself is a welcome break from the ice and frost. What are your favorite crockpot recipes? 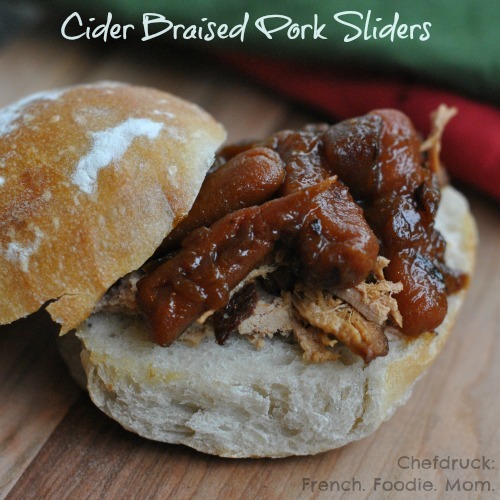 Pork slowly braised in cider and balsamic is one of my favorite dishes to throw together in the crockpot. I love it for dinner, but it also makes a stunning lunch, piled into a cute bun into a slider. There’s something about a slider that’s irresistible. Sliders are so tiny and cute, popping one in your mouth can be done as an afterthought, a delicious lunch with minimal effort. This braised pork recipe is all melt in your mouth sweetness. The apples melt into the carrots which in turn melt into the meat. These are vegetables no one will mind eating. In the last thirty minutes of cooking, I add a little extra water to make sure to have plenty of sweet sauce to drizzle on my sliders. Running out of sauce is a sad, sad thing that can easily be avoided. What come out of the crockpot doesn’t look like much. But once you pull the pork with a fork and top with veggies and sauce, you’re set. The hardest part about this recipe is having alcoholic cider on hand. Seriously. We keep our drinks in a separate fridge in the basement. It’s filled with random bottles of beer left over from summer dinners and the bottles of cider can be tough to find. I’ve tried substituting a wheat beer out of desperation and it completely destroyed this recipe. Pork is such a cheap meat that this is a great way to round out your weekly menu. Use this dish to make weekday lunches exciting again, or have it as a dinner followed by leftovers. Either way, I guarantee you’ll be using whatever bread you have in the house to soak up every last little bit of sweet cider braise sauce. 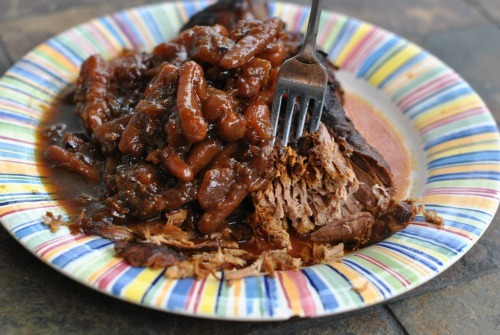 An easy, sweet and comforting slow cooker meal. If you have a multi-function crockpot that lets you sear in the same machine as you slow cook, do everything in the same machine. If not, you'll need to do the first few steps of this recipe in a large saucepan and then transfer everything to the slow cooker. Heat the olive oil in a large saucepan on high heat. Add the roast and brown on each side for about 3 minutes. Remove the roast from the pan and set aside. Add the onions and sauté until soft and clear, about 4 minutes. Add the carrots and apples and saute for another 3 minutes, just to blend all the juices and cook slightly. Now add the meat back in and pour in the beer. Give everything a good stir to scrape up all the caramelized bits from the bottom of the pan, heat still on high, and get the beer boiling. Now add the remaining ingredients: the honey, the balsamic, and the salt and pepper to taste. This is the moment to transfer to a slow cooker if you don't have one of those multi-cookers. Set to high and cook for three to four hours. If you're going to be gone all day, set it to low. This is one of those dishes that's even better the next day. If you're organized enough, set it to cook the day before, let it rest overnight in the fridge, and reheat in the slow cooker the next day for lunch or dinner. 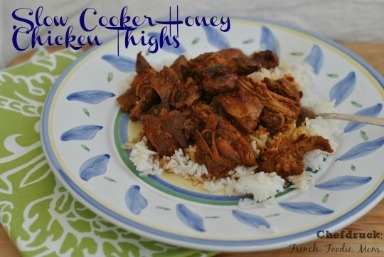 This is the type of recipe where it is really handy to have a multi-tasking crockpot. I have a cuisinart multi-function cooker which lets me sear before I slow cook. Love it and highly recommend it. 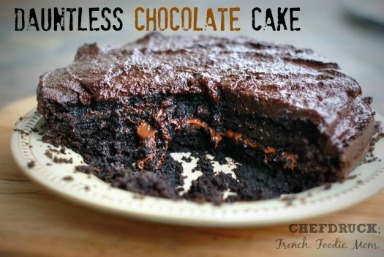 This sounds delicious!! Never thought to add apples – yum!